In the end of January I received an invitation to attend an event where I place high expectations: the SIGFOX Maker Tour Lisbon. The event will take place on the next Thursday (11th February 2016) at Startup Lisboa. I have high expectations because I’m very interested in Internet of Things (IoT) and SIGFOX will surely be a big player in the IoT scene in the following years. SIGFOX is an operated telecommunications network dedicated to the Internet of Things. Being an operated network, SIGFOX developers and users do not have to handle any installation or maintenance operations. This allows developers to focus uniquely on the core of the projects. It is a LPWA (Low-Power Wide-Area) network, currently deployed in Western Europe, San Francisco and with ongoing tests in South America and Asia. It allows bidirectional communication, both from and to the device and the communication is always initiated by the device. The SIGFOX network is designed for small messages sent from time to time, not being appropriate for high-bandwidth usages. It is mostly directed at applications like remote sensors or actuators that only have to communicate small messages a few times a day. Since the network is also focused on energy efficiency, it allows developers to build connected devices that are able to last years on a standard battery. What technology is used by SIGFOX? The SIGFOX network operates on sub-GHz frequencies, on ISM bands: 868MHz in Europe/ETSI and 902Mhz in the US/FCC. It uses an Ultra-Narrow Band (UNB) modulation, which is key for providing a scalable and high capacity network. With a 162dB budget link SIGFOX enables long range communications, with much longer reach than GSM. No negotiation is required between the device and a receiving station: the devices simply emit in the available frequency band, being the signal detected by the closest base stations, decoded and forwarded to the network backend. Protocol operations like deduplication (and others) are handled by the network itself. Messages are then forwarded to the developers own application and made accessible using SIGFOX’s API. Each transmitted message is authenticated using a hash mechanism and a private key specific to the device, offering great protection against replay attacks. What about the messages sent? Each message can contain data up to 12 bytes (96 bits) and you can send up to 140 messages per day. The protocol metadata already includes a timestamp and the device unique id. The limit of 140 messages per day is imposed by european regulations, which state that the 868MHz band enforces a transmission duty cycle of 1%. Since each message can take up to 6 seconds to transmit there is a maximum of 6 messages per hour (1 hour = 3600s; 3600s x 1% = 36s; 36s /6 = 6 messages per hour; 6mph * 24h = 140 messages per day). Cool! How can I get started? 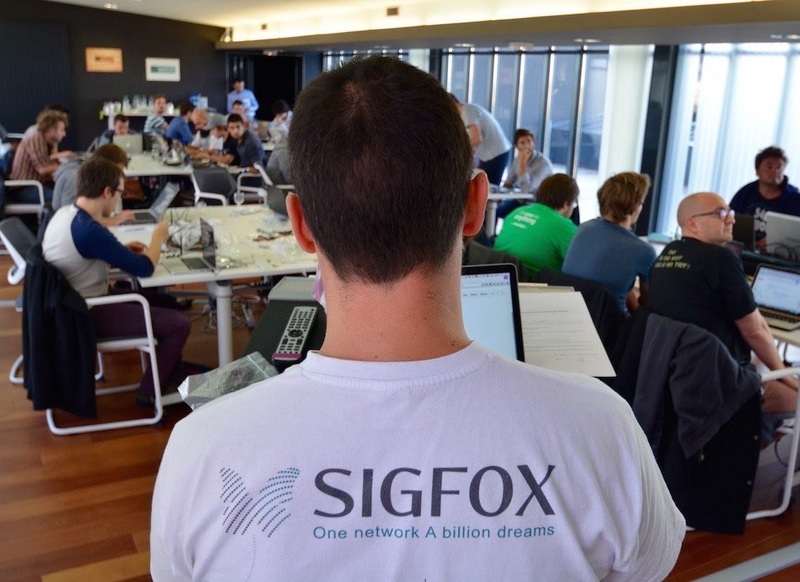 The objective of the event will be to present the SIGFOX technology to the Maker community and support developers in the development of new solutions. The event will last half a day, from 2 to 6PM. 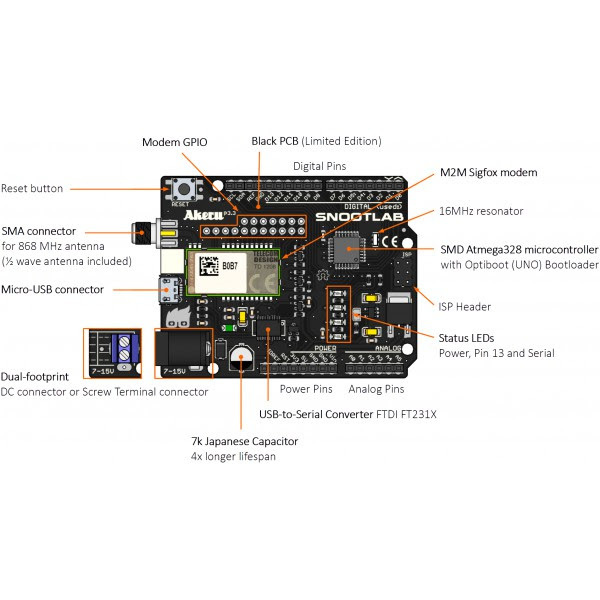 The board is essentially an Arduino Uno with an integrated 868MHz SIGFOX modem. Wanted to attend the event but it’s too late now? Worry not. More events will be announced in the near future by SIGFOX. In the 12th of February of 2016 the SIGFOX Maker Tour will be in UPTEC in Oporto (registrations closed) and in the 16th of February they’re going to FabLab London (registrations still open!). Check their agenda regularly for new events here. Also have a look at the competition: LoraWAN. The thethingsnetwork.com is implementing a free Iot network, where you can deploy your own gateways, and join the crowed source effort for free communications. Also the Lora Chips can be bought at the 6/7€ range (without the Lora stack, where Lora is implemented by an external MCU), and gateways are around 200€. Thanks! I’ll take a look at that too. Any suggestions of good sources of information (parts, costs, tutorials, etc.) on that? Sure: First of all I really do recommend this http://www.nickhunn.com/lora-vs-lte-m-vs-sigfox/ to be read. It’s long, but after the read, we have a better understanding of what is in stake, and why I think, that Lora might win. Regarding Lora: There is the RN2483 module, that has everything on it, and has an AT command set, like the TD1208 for SigFox. It costs around 20€ with IVA and shippment. But this one is for a node, and it has the LoraWan stack on the firmware. Then on ebay and AliExpress there are other chips like the SX1278/1276. Around 7€. This is only the Radio, no stack, so you can use them for point to point communication, with your own protocol, or if connected to an MCU (RPi, ESP8266) you can implement the LoraWan Stack., with IBM LRSC stack. 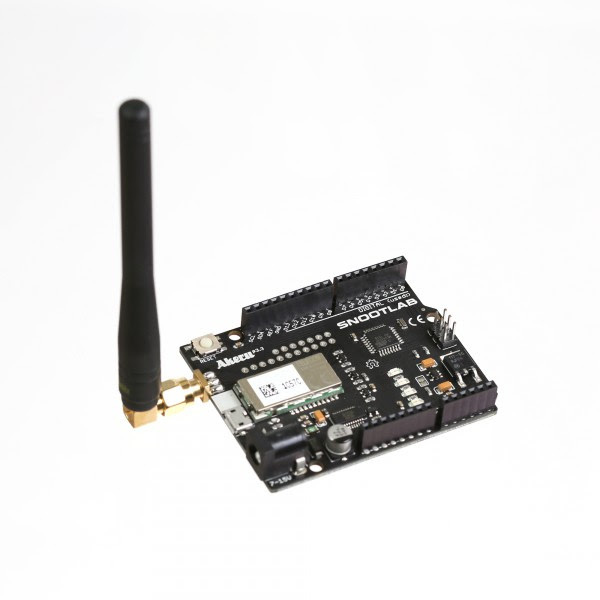 The gateway is more expensive, and the chip is not available to end users, still a gateway module can be bought for around 150€ and a full LoraWan GW can be build for around 200€ with an RPi. There are already shields for that. http://www.daveakerman.com/ <- Not LoraWan compatible but shows how point to point in Long Range works. Hi again! First of all I would like to thank you for all the useful info you provided with your comments. Went through all of the links and I certainly know more about the IoT scene than before doing it. Surely LoRa seems interesting and is also very appealing from the Maker point of view (anyone can set up their own provate/public LoRa network for the local community to use, not depending on any operator nor paying for data). Some time ago at eLab Hackerspace we had some talks about hosting a self-made IoT gateway but never got to the point of doing some actual research on it. The price of the LoRa modules is also very appealing and they’re easily accessible from several known vendors (Mouser, Farnell, Digikey, etc.). Being able to use the cheap 7€ modules with the IBM LRSC Stack is also a good thing. All of this things together, along with some others mentioned in the post by nickhunn, make LoRa something to keep an eye on. However, the network coverage at the moment heavily depends on the efforts of common people/groups of people. I can imagine that some people will put gateways around cities but I don’t see many people putting gateways outside the cities, except for businesses and their networks will probably be private. I also don’t know how “roaming” is going to be handled between cities/countries. Regarding Sigfox, like you said, the advantage is that it is here now and allows roaming across Western Europe. Users have to pay for data but the data costs range from 2-25€/year, which I don’t think to be an outrageous cost at the moment. Also, coverage in Portugal seems to be pretty good, especially where I live, in Algarve (south of Portugal). I have made a few tests with the Akeru board that Sigfox offered me at their workshop and it worked pretty well in several regions of Lisbon and also in Faro. Their backend system also seems pretty easy to use and they’re providing some very good documentation and sample code to get started. I still want to do some more tests in the following weeks/months. I don’t know which one will win. As nickhunn said, maybe neither LoRa, nor Sigfox nor LTE-M will win the “IoT race”. Maybe if more people want it at eLab Hackerspace and we manage to get some funding we can eventually try to deploy a LoRa gateway to do some testing. For now, since network coverage is good all around where I live and I have the required hardware I’ll stick on doing some more tests with Sigfox. Once more, thanks for your comment. I really appreciate all the interesting and useful info you provided. Hi, I’m seeing this from an hacker/maker perspective, so I have my doubts that Sigfox to will get some traction on makers due to the upfront costs. The corporate world is another story, still, if roaming is not needed, a private gateway might make more business sense. The Sigfox Maker tours are great and allow people to get hands on the technology, where the board is free, outside of that the Akeru board is 100€, the Libellium module is around 60€, and while it has Sigfox one year subscription included, still is a running cost on following years. Not an issue, again, for corporate cases, but for a money depleted maker, that’s a lot of money :). With two akeru boards we can make a Lora GW.